The Port of Pollensa is located on the northern tip of the Balearic Island of Mallorca, situated around a large horseshoe shape bay, sheltered by the blue waters and stunning Tramuntana Mountains. Blessed with magnificent scenery, beautiful white beaches and friendly atmosphere, Pollensa is the perfect recipe for a great holiday, having a little of everything: beaches, yachts, cafes, pubs, restaurants, nightlife, shops and breathtaking surroundings. An ideal destination for those who want to have fun but also for those who prefer tranquility, Pollensa is a stylish resort, just one hour and a half from the capital Palma. The Port of Pollensa faces two photogenic headlands, jutting out in the pristine Mediterranean Sea, and in turn sandwiching a beautiful bay, secretive coves and rocky outcrops. 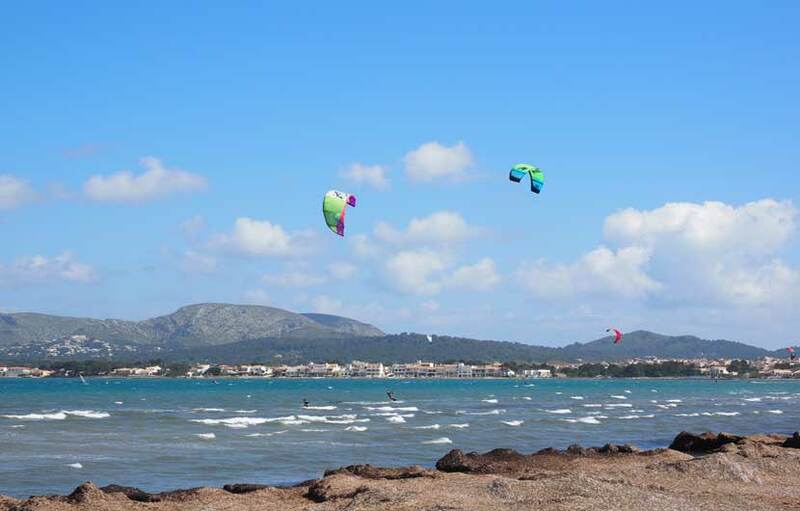 Water sports, boat trips and cycling are in great demand in Pollensa, there are a couple of wind surf schools right on the beach. In the past Pollensa has welcomed such illustrious people as Winston Churchill and Peter Ustinov; it is also a land which inspired Agatha Christie. The town’s promenade and port area, provides an extensive seaside walkway alongside amazing beaches – some of the best in the country. The area enjoys plenty of sunshine and not much rainfall throughout the year, being neither too hot nor too cold – just perfect. While you’re there, take the time to explore around the island. The warm shallow waters of the bay has made it especially attractive for families with small children as the whole family can bath and have plenty of fun in safe, warm waters. There are a number of smaller beaches in the area, all have good quality sand. A walk through the harbour offers a beautiful view over the sea, town and surrounding countryside, then head off to the main street where you will find all kinds of souvenir shops, leather goods, clothes, shoes and accessories as well a number of low cost supermarkets. Pollensa promenade comes alive in the warm summer evenings with the beautiful smells of fresh local fish being grilled or barbecued. There is a good selection of shops, bars and pavement cafes to choose from, although towards the end of October when the cooler winter temperatures kick in, a number of establishments do close down until around the following Easter time when the season starts and happy visitors return to the island once again. The old Roman historic town of Pollensa is located some 5km inland from the port, and is certainly worth a visit with many of the narrow streets making it ideal for exploring and, much of the town dates back to the 18th Century. One of the local fiestas of note is celebrated On Good Friday, a figure of Jesus is slowly carried by torchlight down from the Oratori to the church of Nostra Senyora dels Angels, in the Davallament , one of the most moving religious celebrations on the island. There are further magnificent views from the Ermita de Nostra Senyora del Puig, a rambling, mostly eighteenth-century monastery which occupies an extraordinarily serene and beautiful spot on top of the Puig de Maria, a 320-metre-high hump facing the south end of town. 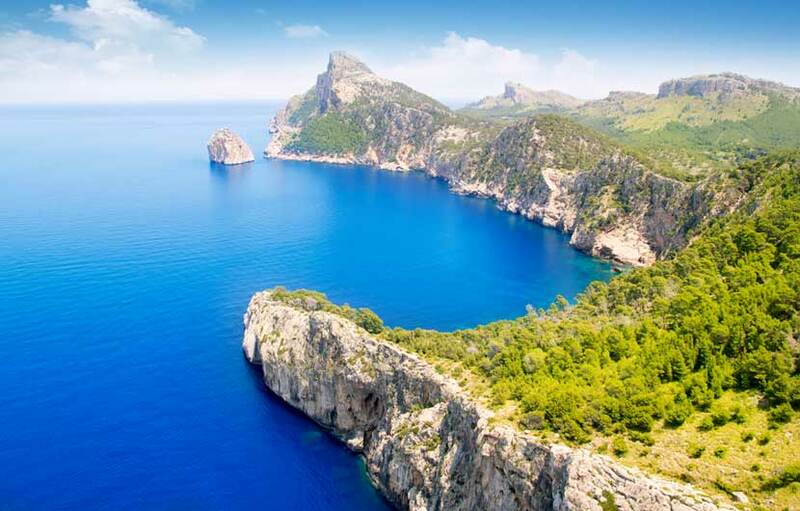 We have compiled a comprehensive Spain travel resources page to help you plan and book a trip or holiday to Pollensa and Mallorca with a budget busting hotel search comparison platform, travel insurance, low cost flights, discount car hire, tours, excursions as well money saving travel and holiday deals. Puerto Pollensa is the furthest resort from the island’s airport at Palma, another great reason for having a hire car. Pollensa is a breath of fresh air compared to the busy resorts on the island with a more laid back atmosphere. There are a multitude of luxury yachts moored in the bay of Pollensa which bobble alongside colourful fishing boats and is an artists dream. The biggest natural feature of the area is the imposing range of mountains Sierra de Tramuntana which surrounds and shields the town. For foodies be prepared to eat well; the cosy, rustic Mediterranean-style cooking is sure to tempt your senses. And for desert, why not try some ensaimadas and the traditional almond gateaux. This is a popular restaurant serving delicious seafood and Mediterranean style cooking. There is warm welcoming atmosphere without being too stuffy with smart casual dining. Popular dishes include the monk fish, seafood and rice. This highly rated restaurant is located on the square on Calle D’Atoni Maura. A village located 436m above sea level, Valldermossa is one of the most scenic places you can ever visit, and words cannot describe the views. Culture lovers will recognise the name as it was the home of composer Chopin and George Sand, his lover, during the 1800’s. If you want to see another beautiful village in the Mallorcan mountains then head on up to Fornalutx. The winding narrow streets and tiny shops give the impression you are hundreds of miles away from civilisation, not just a short drive from some of the best resorts on the Med. This peninsula which just right out into the Med offers some of the best photographic opportunities on the island. Most of the postcards showing shots of Mallorca were taken from this point which is also a haven for a vast array of beautiful and very colourful birds.